Operating for over 20 years, HARD software has the unparalleled experience of developing the market, trading and operations software you need to maximise market revenues and mitigate all of the compliance and financial risks for renewable generators. HARD software’s Infolite Intermittent Generation Management System combines all the essential trading and market systems for operating a semi-dispatched generator in the Australian National Electricity Market (NEM). Manage, and execute your utility scale battery storage trading, operational process and status from easily and efficiently, from any device, whilst maximising the value of your investment. Automate National Energy Market energy offer creation, submission and resubmission, acknowledgement matching, market data extraction functions, logging, error handling and reporting. HARD software as part of Dispatch Solutions is finalising research and development for an accurate short term generation forecasting system. The forecasting system allows wind and solar farms to provide accurate forecasts of their output into AEMO’s central dispatch system to improve causer pays factors, reduce head room requirements for delivery FCAS contingency services and improve NEM system reliability. The Australian National Electricity Market (NEM) runs on large amounts of data and participants in the market have access to their own dispatch outcomes, market states and historical data for all providers after the current day of operation. Access to timely current data is very important to our renewable generator customers to ensure that they respond quickly to market curtailments, react to significant market events and are able to historically analyse their performance with respect to other competitors. Infolite includes a full SQL relational database system and the managed infrastructure to load and store all of the market data required by the customer. A full web based query system is also supplied, in addition to allowing the customer to connect to the MMS database using any analysis tools such as Excel or Tableau. Infolite has a complete suite of standard management reports that are automatically generated and emailed to our customers, including daily revenue estimate, meter reconciliation, competitive performance and generation history reports. Bespoke reports can be run using the same reporting infrastructure for any data based needs that are specified by our customers. Managing a renewable generator semi-dispatch cap reliably is the most critical task that a renewable generator must implement in the Australian NEM to ensure that the generator complies with the dispatch instructions from AEMO. The Infolite system is a proven and industry standard solution that complies with all of the AEMO registration and market participation requirements and provides the software systems that generators need to operate, understand and deliver maximum generation and revenues resulting from their dispatch in the NEM. Infolite provides a fully AEMO compliant market dispatch infrastructure to reliably communicate the semi-dispatch cap, FCAS enablements and other electrical market constraints to the renewable generator's SCADA system. Infolite also reads the critical plant state and operating conditions into the Infolite database system so that the operator of the plant can ensure that they are maximising their revenue and are protected against losses due to adverse market conditions. It is not enough that a renewable generator SCADA limits their plant's generation when they receive a sem-dispatch cap. The generator needs to know when they receive a cap, why they received the cap and also if they need to change their market offer or other actions to ensure that revenue is not reduced or generation is unnecessarily lost. Infolite has email or message alerts to notify customer personnel when any market event occurs such as receiving a semi-dispatch cap. Infolite provides a powerful and effective dynamic web dashboard for the generator so that all stakeholders can quickly monitor market outcomes, revenue projections and weather conditions without access to or the knowledge of how to use a proprietary SCADA system. Every renewable generator in the Australian NEM is required to submit any changes of availability to AEMO when their production capabilities changes by 6 MW or more. Availability changes within 7 days are required to be entered to the nearest half hour and planned outages for up to the next two years are entered for the entire day. The Infolite software includes a visual drag and drop submission system designed specifically to meet the needs of renewable generators in the NEM to provide quick and simple availability submissions to AEMO. The Infolite availability system uses a graphical GANTT style user interface where plant limits and turbine or inverter availabilities can be quickly entered individually or as a collector group or section. Adjustments can be made by selecting and dragging any outage to a new time or extending or reducing the length of time for an outage by dragging the end of the outage bar. Availabilities can then be submitted to AEMO by clicking a single button. No more laboriously adding up numbers of turbines or inverters and wrestling with the AEMO default submission system. The Infolite availability system allows the separate functions of availability submission to be split between different sets of users. A common workflow is for staff on site to enter in the outages into the availability system, and other staff such as management or traders to review and submit the availabilities to AEMO. All users can view the generator availabilities so that the present and future status of the plant can be viewed by all relevant stakeholders. Utility scale storage solutions are the missing component of the NEM that would enable high levels of renewable generation in a stable and robust electrical system. Australia is leading the world with the wide spread implementation of large utility scale battery installations and determining how these batteries can be effectively and economically integrated into the NEM. Battery Energy Storage Systems (BESS) are dispatched rather than semi-dispatched generators in the NEM when they are greater than 5 MW and can provide energy storage as well as provide contingency and regulation Frequency Control Ancillary Services (FCAS) and potentially other contracted services. A number of battery manufacturers and third parties have developed single plant and portfolio optimisations that can provide the day to day energy and ancillary service offers for the running of a BESS efficiently in the NEM. HARD software has developed an industry standard WEB API and associated web based trading systems that allow for optimised offers to be submitted to the market for each dispatch interval, provides monitoring of the offer process and dispatch outcomes and the ability to temporarily suspend automated offers and use a set of templates to respond to market events or AEMO directions. Smaller BESS installations may not need the sophistication and higher levels of investment that are required for a fully optimised energy and FCAS BESS solution. HARD software has developed a simple business rule based system, using the same WEB API interface as the more sophisticated optimised systems, for small BESS plants that can automate the operations of the BESS whilst considering the relevant market conditions and allow the system to adapt offers to capitalise on favourable market events. A simple web based interface is provided that provides the operations and trading staff the ability to monitor operations and swicth to manual trading when required. Short term generation forecasts for 5 minutes in the future are very important for renewable generators in the Australian NEM as the forecasts are currently determined by the AEMO ANEMOS central forecasting system and poor short term generation forecasts can lead to large FCAS causer pays factors and therefore potentially large FCAS regulation costs. Also accurate generation can be used to lower the headroom requirements for delivering FCAS contingency services thereby lowering the cost of delivering those services and also leads to greater overall system security for the market as better renewable generation leads to greater generation certainty and therefore reduced requirements for FCAS services. Dispatch Solutions, a joint venture between Greenview Consulting and HARD software, has been formed to cooperatively develop forecasting solutions and provide intelligent trading systems for the Australian and International energy markets. HARD software as part of Dispatch Solutions is currently actively developing a robust wind short term generation forecast designed to accurately forecast the generation for the end of the current dispatch interval. The technology used for the wind forecasting systrem has been presented at international conferences in India, Berlin and Denmark and has been successfully applied to a variety of wind farms with varying topology, turbine sizes and layouts, with performance that greatly exceeds the forecasts obtained using simple persistence forecasting. The system is about to be integrated with the AEMO generation wind forecasting API and is currently available for new implementations. 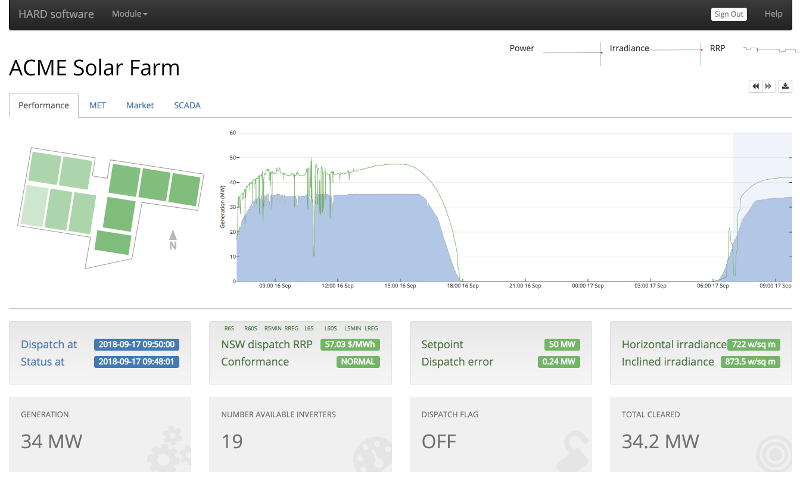 Dispatch Solutions in conjunction with our industry partners Solcast, HARD software has been trialling a short term generation forecast for solar farms for over a year and is currently part of an ARENA project to implement the system at up to 6 different solar farms for evaluation and testing. New utlilty farms could be implemented with this technology that is also currently being integrated with the AEMO generation forecasting API.